This patriotic pirate brings back the days of Paul Revere. 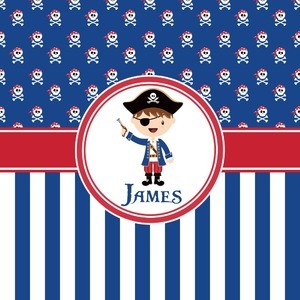 The traditional black and white skull and crossbones are adorned with red and white polka dot dew rags and are highlighted on a backdrop of patriotic blue. The coordinating bottom pattern of patriotic blue and white stripes ties the entire design together. A wide band of red, trimmed in white highlight the pirate boy in the circle label. Add your personalization in the label to complete the look.